Aqua1man.net can be persistent and may re-appear if you leave some associated files on the system. Scan the system with an anti-malware program and eliminate all traces of the PUP. Aqua1man.net adware is the program that focuses on redirecting online traffic to affiliated or sponsored sites. Aqua1man.net is the potentially unwanted program that redirects online traffic to questionable websites. This site affects your browser with all those unwanted notifications and spam content. Advertisements, commercial or even malicious content can lead to infiltration of additional PUPs or malware. You may get unintentionally redirected to this website, and a one-time visit is not going to harm your computer. However, constant redirects to this page indicate that the adware program is causing these issues on the machine. Also, you can be sure that cyber infection is affecting your device if the system is running sluggishly and Internet Explorer, Mozilla Firefox or Google Chrome freezes and crashes. You may encounter a “Confirm content” message on this site and interacting with this pop-up can lead to unwanted push notifications. Aqua1man.net virus is the pop-up redirects causing-cyber threat. It uses various social engineering techniques to generate pay-per-click revenue. One click on the redirected window or pop-up advertisement can expose you to malicious content and open up dozens of commercial pages with questionable material. Intrusive behavior is only the first symptom of Aqua1man.net. Your browser gets affected, and it is the symptom that you can easily spot. However, freezing browser and sluggishly working device is not the biggest issue. It also modifies various settings of your browser, for example, allows push notifications that go directly to your desktop when the browser is shut off. It is known that Aqua1man.net triggers other redirects and you should be careful because clicking on those newly-opened windows can get you to malicious page or trigger and automatically launch the download of useless tools or programs. In most cases, content that is shown on these pages promotes questionable software, tools and tricks users into purchasing them. People complain that this type of cyber threats are persistent and difficult to terminate. Fortunately, Aqua1man.net removal is possible with anti-malware programs. This automatic system cleaning gives the advantage of eliminating all possible threats in one step. When you employ Reimage or a similar tool, you can perform a thorough system scan and find all potentially unwanted programs including Aqua1man.net. You should already have antivirus tool on the system and running, so sites like this can get blocked even before the infection. Since Aqua1man.net can alter your browser settings including the notification preferences, you should manually change them back to default and block every suspicious site from the list. Go to your browser and locate Menu. Then find settings and expand to Advanced. Select Content settings under Privacy & Security to find Notifications options. Then you need to go through the list Block notifications instead of Allow. Remove all questionable sites from the list entirely. Repeat these steps for all of your browsers. Aqua1man.net is the potentially unwanted program that makes browsing online barely possible due to the intrusive content it delivers continuously. When users are not paying close enough attention, software bundles can get distributed easily during the installation of programs or software. Downloading programs from the internet is never considered a good idea because of questionable sources and additional program installation. Many experts stress the importance of this issue. 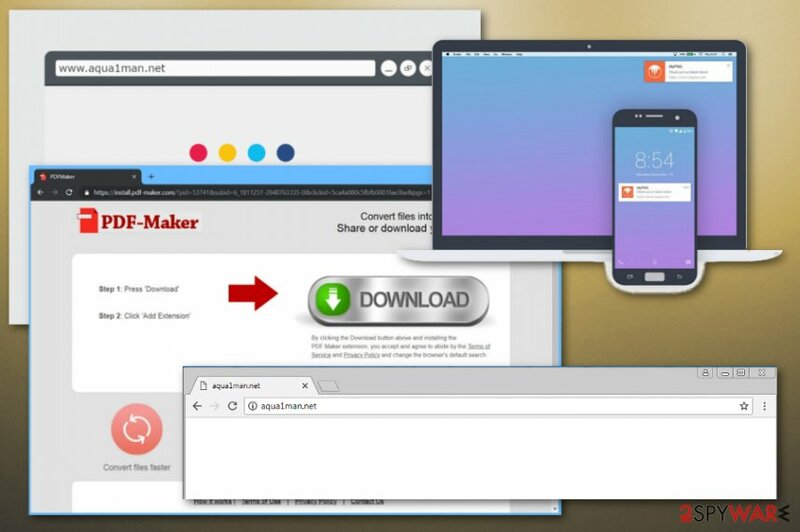 Freeware providers make their products in association with PUP providers and deliver those bundles online, on p2p services, file-sharing networks. Skipping through steps during installation automatically allows all included programs to get downloaded without users' permission. When you opt for Advanced or Custom installations, all files can be seen on the list and some of them de-selected if there is something you don't want to get. Also, keeping antivirus tool running on the machine all the time helps with blocking harmful websites. Keeping intruders like this adware can put your machine at risk of getting more severe malware. You need to remove Aqua1man.net as soon as possible and make sure to delete associated files or tools, extensions before using the computer as before. Aqua1man.net removal takes a few minutes, but during the full system scan, your machine gets entirely cleaned. Scanning the PC with anti-malware program helps to fix all issues regarding the poor performance or malware infections. Here, look for Aqua1man.net or any other recently installed suspicious programs. Wait until you see Applications folder and look for Aqua1man.net or any other suspicious programs on it. Now right click on every of such entries and select Move to Trash. When in the new window, check Delete personal settings and select Reset again to complete Aqua1man.net removal. Once these steps are finished, Aqua1man.net should be removed from your Microsoft Edge browser. Here, select Aqua1man.net and other questionable plugins. Click Remove to delete these entries. Now you will see Reset Firefox to its default state message with Reset Firefox button. Click this button for several times and complete Aqua1man.net removal. Here, select Aqua1man.net and other malicious plugins and select trash icon to delete these entries. Click Reset to confirm this action and complete Aqua1man.net removal. Here, select Extensions and look for Aqua1man.net or other suspicious entries. Click on the Uninstall button to get rid each of them. Now you will see a detailed dialog window filled with reset options. All of those options are usually checked, but you can specify which of them you want to reset. Click the Reset button to complete Aqua1man.net removal process. ^ Lucian Constantin. Online advertising poses significant security, privacy risks to users, US Senate report says. Networkworld. Network news. This entry was posted on 2019-04-04 at 07:45 and is filed under Adware, Viruses. You can quickly scan the QR code with your mobile device and have Aqua1man.net manual removal instructions right in your pocket. How did you remove Aqua1man.net?